Blithe Spirit is the smash comedy hit of the London and Broadway stages, this much-revived classic from the playwright of Private Lives offers up fussy, cantakerous novelist Charles Condomine, re-married but haunted by the ghost of his late first wife, the clever and insistent Elvira who is called up by a visiting "happy medium", one Madame Arcati. As the (worldly and un-) personalities clash, the two "blithe spirits" haunt the hapless Charles into perpetuity. 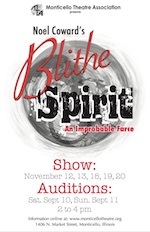 Auditions for Monticello Theatre Association's Blithe Spirit will be held at the Phoenix Theater on Saturday, September 10th and Sunday, September 11th from 2 to 4pm.